Lorenzo Villoresi, the fragrance house by the Italian perfumer of the same name, is a brand that I have to admit that I haven’t had a great deal of exposure to. My experience with the house extends to a quite disastrous encounter with their most popular fragrance – Teint de Neige, a baby powder mess that really isn’t me at all. But, I won’t let one bad experience taint my idea of a brand, and I have heard positive things about the rest of the line, so it is with great interest that I try their latest release – Theseus. Base: Leather, Vetiver, Patchouli, Agarwood and Tonka Bean. Notes of Amber and Musk. Ahh, the ‘masculine woody citrus’, if any genre was furthest from my tastes then this would be it. That’s not to say I don’t like this type of fragrance, not at all, I am more than happy to smell it on my boyfriend (who is a big fan of the genre), but It’s not something I would ever pick out for myself. This is why Theseus has come as a big surprise for me, I really like it, and what’s more I really enjoy wearing it. Theseus opens like an olfactory firework, with bright citrus colours, crackles of black pepper and loud bangs of zingy citrus. The mouthwatering and sunny citrus notes are quickly bolstered by the addition of dry woods, which form the main structure of the fragrance and hold strong right the way through to the dry down. As Theseus develops it does become more subdued, but it isn’t a quiet fragrance in any sense of the word and it has a distinct presence and character. As time passes, the golden sun of the citrus become lower in Theseus’ sky allowing the woods (cedar and agar wood) to take centre stage, but the sun never really sets and the light of the citrus is cast, in varying hues throughout the development. 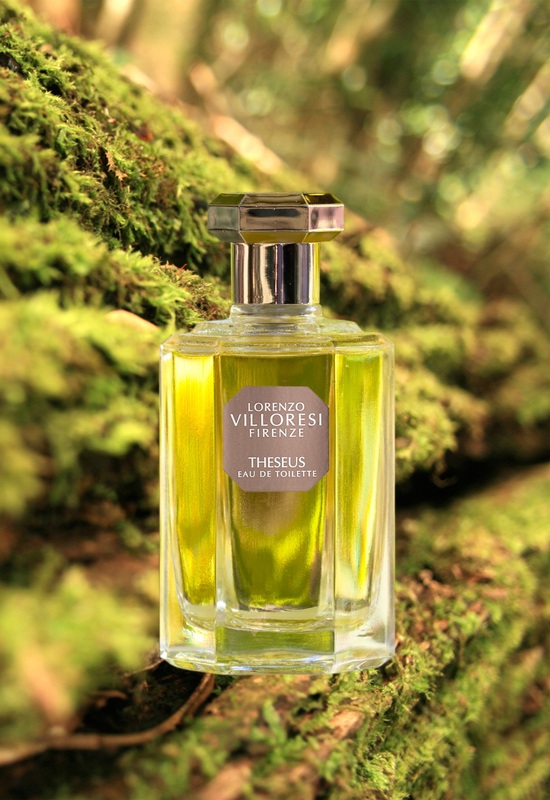 Vetiver plays an important part within Theseus and it’s use is reminiscent of Guerlain’s classic Vetiver, it is sour, rooty, earthy and has strong inflections of ginger and citrus. Theseus is less vetiver-centric than the Guerlain and the comparison ends with the addition of patchouli and green florals. The base retains Theseus’ woody-citrus signature but softens it with leather and musk, both of which are used with a subtle hand. I have to admit that I don’t smell any of the tonka bean mentioned in the above list of notes, and I would say that it’s not missed, Theseus has a dry quality to it that, whilst complimented by the sparkling citrus, feels assured and well-balanced. Theseus sits within that genre of confident and comfortable masculine fragrances that feel like they could be worn with the most casual or the smartest of clothing, all they need is a dash of masculine confidence to seal the deal. Whilst this genre of masculines may not be my cup of tea, Theseus goes a long way to convince me otherwise and despite the fact that I’m not entirely sure it would be something I would buy, I would be lying if I said I wasn’t tempted. Try this if you are looking for a comfortable and versatile masculine fragrance. Theseus is available in 50ml and 100ml Eau de Toilette, prices range from €78-€90. This review is based on a sample of Theseus from my own personal collection. The title (“Under Slow and Solitary Suns”) is a lyric from the Patrick Wolf song ‘Theseus’ from the album ‘The Bachelor’. Posted in Citrus, Lorenzo Villoresi, Masculine, Woody and tagged 2011 Release, Citrus, Lorenzo Villoresi, Masculine, Perfume Review, Theseus, Woody. Bookmark the permalink. I love the smell of the ‘masculine woody citrus’, how should I got it as soon as possible. You know, the Christmas is coming. Yes, not long to go until Christmas, I’m not entirely sure when it’s available, I have seen it online in some stores but nowhere in the UK. In England can get this already from Les Senteurs (also online). Agree about Teint de Neige, too much like Johnson and Johnson, but Sandalo from Lorenzo Villoresi is the gold standard of sandalwood for me. Thanks for clearing that up, I didn’t know it was available already. It’s always nice to hear about a fragrance that appeals even though the genre isn’t usually a favorite. I tend to think of those as must-trys. Definitely, and Theseus is most certainly a must-try! My favourite from this line is Piper Nigrum which is more an assorted spice and herbs rack than just pepper as the name implies. I haven’t tried Theseus yet though nor Teint de Neige. The line has a great Patchouli and a Vetiver right from the guts of the underworld. Anyone who thinks Vetiver Extraordinaire is dark and rooty they should try this! I think you might like Piper Nigrum and most possibly Dilmun, the pissy-est orange blossom I have ever smelled. Thank you for the suggestions, I shall make sure to try Piper Nigrum, Dilmun and the vetiver!